Outline plans have been revealed for a new motorway service area (MSA) in Rotherham that would create 300 jobs. 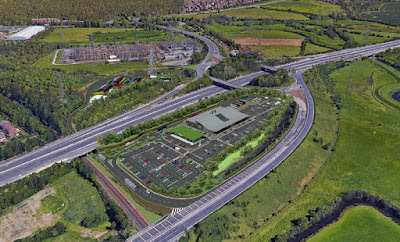 Rothbiz revealed first that landowners and developers believe that their site at Junction 33 of the M1 at Catcliffe in Rotherham is preferable to the site at Junction 35 at Smithy Wood in Sheffield where a long-running planning battle continues. 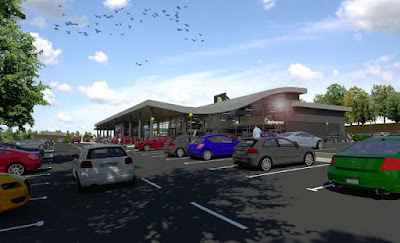 Applegreen plc, a major petrol forecourt retailer in the Republic of Ireland with a significant and growing presence in the UK, has now submitted plans to Rotherham Council having undertaken public consultations earlier this year. Currently scrub land on either side of the motorway, the plans, produced by Hadfield Cawkwell Davidson, are for HGV parking and amenities to the north of the M1 with customer parking and amenities for other motorway users to the south of the M1, via an underpass. The site is zoned for mixed use and previous plans for a hotel and pub were approved but never implemented. Access to the site is set to be via a new entrance on the Rotherham side of the roundabout passing through an area of Greenbelt. The exit is via a proposed connecting slip road to the south of the site, which leads back to the Sheffield side of the roundabout. A second option for access from slip lanes on the M1 is also included. A detailed transport assessment has been submitted with the plans which concludes that, with the new lanes and junction improvements, there would not be an exacerbation of current traffic conditions at Junction 33. The Parkway from Rotherham to Sheffield is one of the most congested routes in the UK. £1.4m was secured from the Department for Transport (DfT) to develop plans for the area. Work has taken place to widen exit slip roads and roundabouts at Junction 33 and Rotherham's capital strategy includes a £45m plan to widen the Parkway to three lanes between the M1 and Catcliffe. Buildings would be one and two storey and include filling stations and amenity buildings. Parking for 454 cars and 67 HGVs is included. In light of controversies seen at the Smithy Wood site, where ancient woodland would be lost, the Applegreen plans also include proposals to enhance eight hectares of woodland to the north of the site. The plans show that, when operational, "the MSA would employ circa 300 staff and represent a circa £40m investment." At peak time during the nine month construction phase, some 200 construction related workers could be on-site. An assessment of the economic impact of the scheme by Axis consultants states that it would add an estimated £4.75m to the economy of the local area each year and concludes that: "The effects of the Proposed Development would be major, beneficial and significant and would make an important contribution towards overarching policy targets to increase employment levels." A comparative assessment has been carried out between the Extra development at junction 35 and the Rotherham MSA development at junction 33. It concludes that the Applegreen proposal is "materially preferable in terms of all of the key planning, environmental and technical evaluation criteria." The assessment shows that the Junction 35 site is less appropriate as it is all in the Green Belt. It adds that the Applegreen plans undermine the Extra plans, which have been undetermined for over three years, by offering a deliverable alternative site. No doubt if it's passed it will have Sheffield in the name rather than Rotherham !